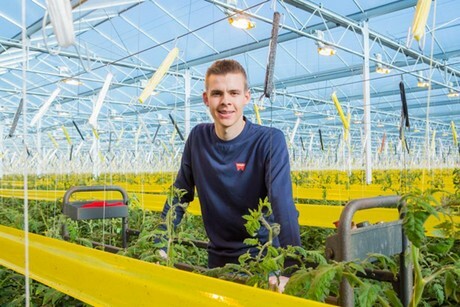 "Adding a 13.6 ha greenhouse to an unsuspecting market can disrupt things"
Not only is the scaling-up continuing in the Netherlands, greenhouse horticulture companies are also growing in Belgium. Even when in the case of John and Mitch Vermeiren it concerns a takeover. 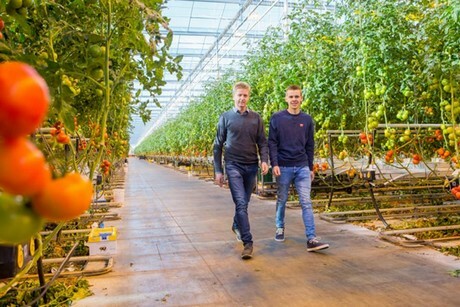 The Father and son team took over Meer Fresh (13.6 ha), located next door to them in the Belgian Meer. Also after their purchase, the two remain loyal to Van Nature, which already was arranging the sales for Meer Fresh. A strategic consideration, says John. "Putting a production of thirteen and a half hectares on a market that does not anticipate it, can disrupt things." The Vermeirens are among the larger tomato growers in Belgium. Father and son Vermeiren are also owners of VW Maxburg, a cultivation company with ten hectares. "Meer Fresh is situated at the back of VW Maxburg. It is a well-running company, built up by Anja and Pieter Geerts." Meer Fresh is known to the trading partners as a supplier of lighted cultivation vine tomatoes. The company also supplies medium truss in regular cultivation. With two flowpack machines in the hall there is capacity for in-house packaging. Of the 13.6 hectares at Meer Fresh, 8.8 hectares is lighted. The largest acreage - almost 8 hectares – is used for Merlice, a large truss tomato. Almost 5 hectares is filled by Sevance, a medium-sized truss tomato with a beautiful deep red color. At the request of Van Nature, there is also a hectare of Lyterno, a finer truss tomato. For the time being, not much will be changed in the Meer Fresh formula. Mitch: "In the future, most likely we will continue with the trusses. I mainly take care of the daily management. My father is more involved with the larger decisions. But we discuss about a lot of things." Mitch: "We have a unique heat coupling between Meer Fresh and VW Maxburg." In terms of sustainable design, the new purchase of the Vermeirens is future proof. Mitch: "There are three CHPs on the site, good for a total of 8.3 megawatts. With these we provide the greenhouse with heat and CO2. We use the electricity for the lighting. And we have a unique heat coupling between Meer Fresh and VW Maxburg that is situated on the adjacent plot. Thanks to this coupling, we can exchange heat. If we have a shortage or too much heat at a company, we set up the heat transfer and start the exchange." Meer Fresh already was and will remain a member of Dutch grower cooperation Van Nature. Father John explains this: "We are used to cultivating what the customer demands. In other words, we do not expand the acreage if there is no demand for it. Putting a production of 13.6 hectares on the market can disrupt things. In the short term the advantage is that we do not have to adjust the internal organization in a hurry and the transition will be smooth. The current end customers were not even aware of the acquisition."